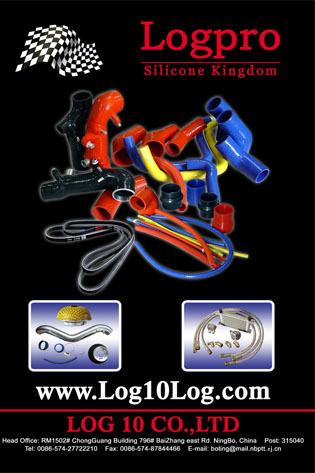 Since year 2000, Logpro is dedicated to manufacturing perfection at its best. Especially in reinforce silicone products, Logpro got very rich experience, advanced technology and full-range facility, which make us very professional in service. meanwhile, our R&D group also performs quickly in accordance with customer's requirement. normally any new products development period is never over 20 days. At present, we have developed full range universal items and our specific items range is expanded always for new fashion & new vehicle application of high performance in racing sports and fast road car! Meanwhile, Logpro has developed manufacturing partners with the strictest quality control standard in manufacturing affiliate components in the field, gas/oil/fuel filter, intake pipe, alluminum oil cooler & intercooler, ignition coil, steeling wheel and more? Log10 & customer service team will continue to work closely with consumers and distribution partners worldwide to conform to the industry旧 quality standard demands for innovative designs of tomorrow旧 market?